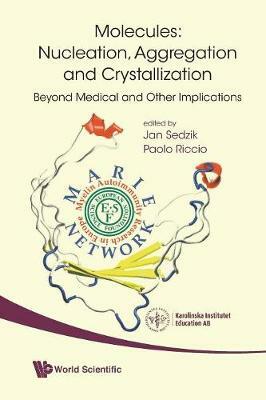 This volume, dealing with Nucleation, Aggregation and Crystallization, consists of a compilation of lectures offered at the international course held at Karolinska Institute and at the scientific meetings of the MARIE Network.The word "nucleation," derived from "nuclear family," refers to the concept of the progenitor, or the mother and the father of any family. Only in the last few centuries have physicists "borrowed" the word, and more recently, biologists for Theodor Schwann's cell theory. Most recently, the term has come into use in atomic theory, spectroscopy, and radioactivity, as well as in the fields of atomic bombs, fission, and fusion. Nucleation as a physicochemical process is followed by two poorly understood phenomena - aggregation and crystallization - which underlie disorders like Alzheimer's and "mad-cow" disease (aggregation of amyloid plaque), cardiovascular diseases (deposition in coronary vessels of cholesterol and lipids), and the appearance of crystals under physiological conditions (gout, silicoses, and liver or kidney stones).Written by leading scientists in the field, including one Nobel Laureate, this book provides a unique perspective between the physical and chemical sciences on the one hand, and the biological and medical sciences on the other, and should be of considerable value to scientists, physicians, students, and the interested lay public.